There are only a few brands in the watch industry that meet the standards of the “Geneva Seal”. Well, Roger Dubuis is known to be one of them. 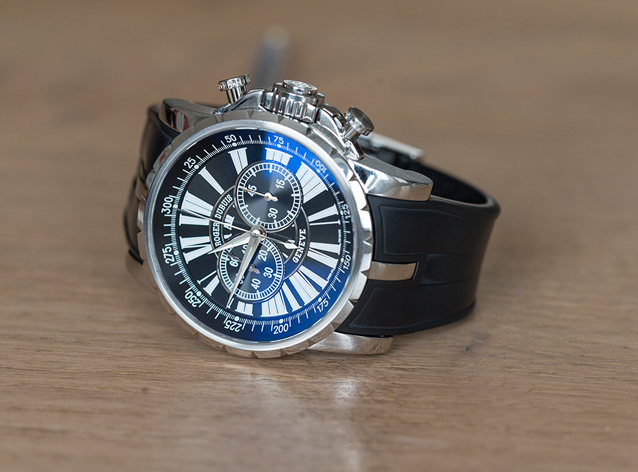 Today we got our hands on the Roger Dubuis Chronoexcel, a perfect example of the fusion of the brand’s unique style and twenty-first century‘s technology. RD really has a very special position among high-end watch brands. Lately their “Easy Diver” series received a lot of appreciation from watch lovers. The brand has its very own politics. 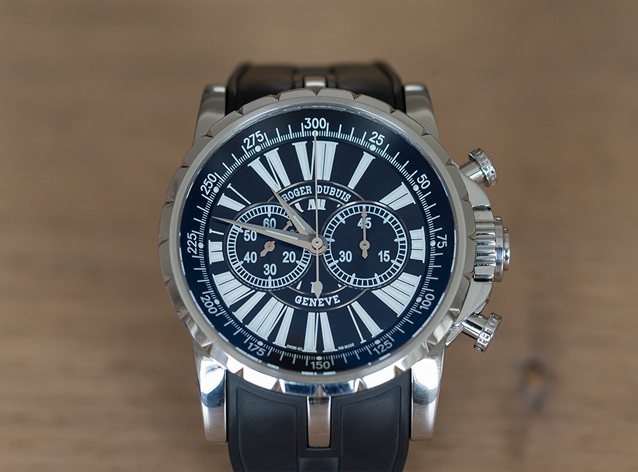 The Geneva Seal on their timepieces mixed with their exotic designs makes them a heavy hitter. 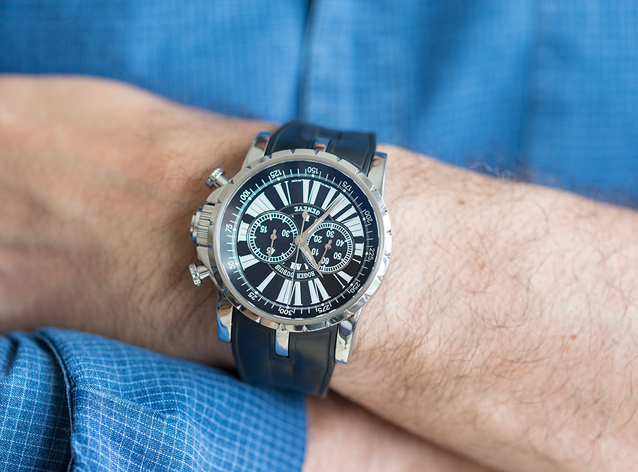 This fusion between daring designs and highest-grade movements is not only unique, but also certainly very cool. 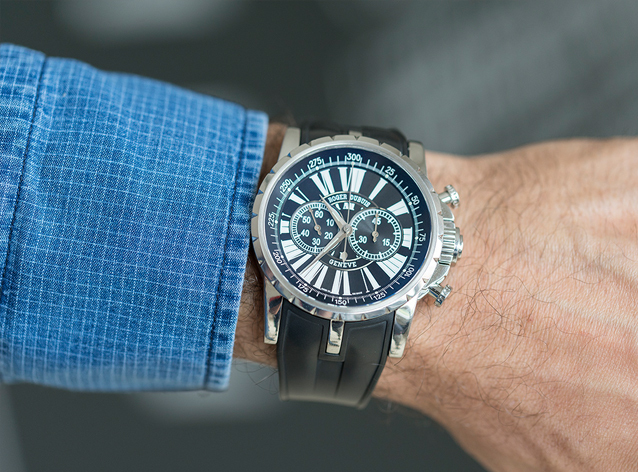 The 46mm case equipped with a rubber strap and a chronograph complication might not be for everyone. For those however, who are fans of RD’s avant-garde vision and style, this is certainly a perfect timepiece. White details on the dark navy colored dial remind us about RD’s style, by combining traditional and contemporary features. 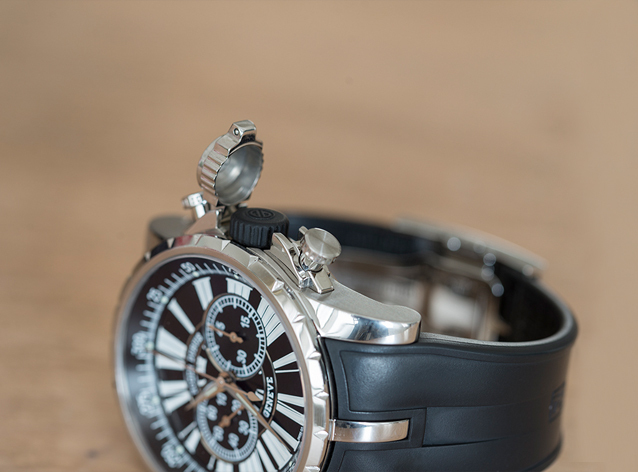 The watch features funky roman numerals as indexes, which are in perfect harmony with the overall look of the watch. 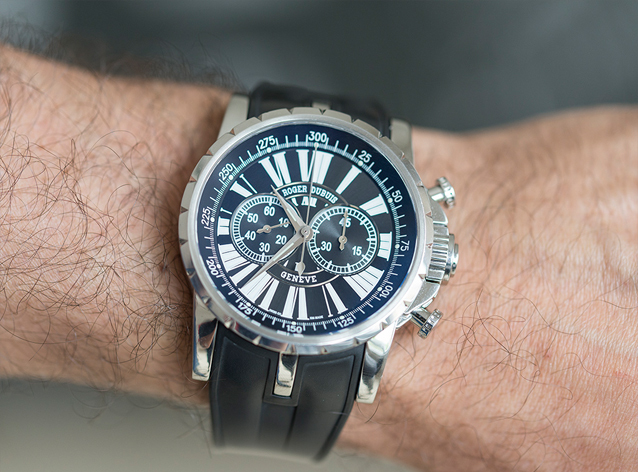 Digit indexes on the chronograph sub dials make it easy to read them from all angles. RD granted the watch a traditional touch by the bi-compax layout on the dial. In addition the lack of a date window gives further visual integrity to the watch. 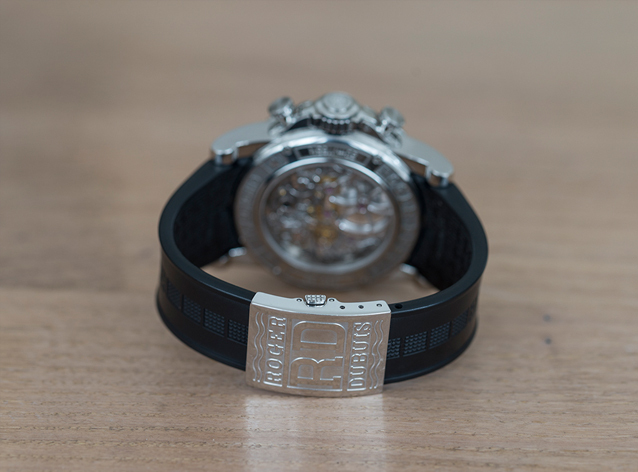 RD makes it very clear that they deserve the Geneva Seal, as on every detail you will find astonishing finishing and workmanship. I would like to emphasize that despite its robust size the watch feels very nice on the wrist. The RD Chronoexcel has perfectly ergonomic lines, especially when on a rubber strap. It will sit with greatest comfort even on smaller wrists. The folding clips further add to the attractive appeal of the watch. The rubber-coated crown takes its place under a stylish protecting cover. I can truly say that the crown and chronograph pushers give an outstanding feeling when being handled. As we all expect from the brand, RD brings life to the Chronoexcel with their in-house made RD78 calibre. The RD78 referenced movement was granted the Geneva Seal, which represents one of the highest standards in the watch world. 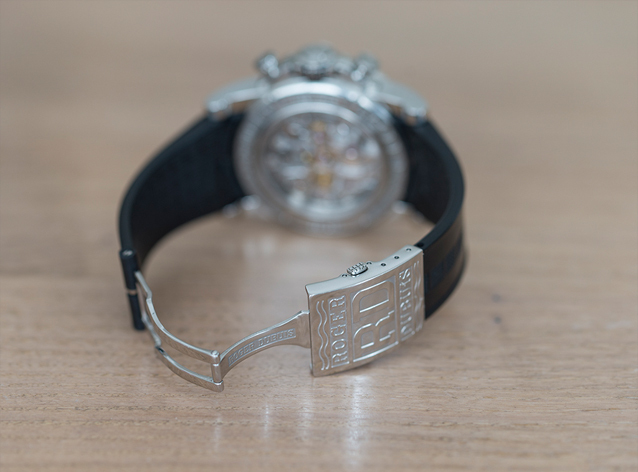 The calibre is made of 300 parts featuring 36 jewels, but is still rather slim at only 5.8mm of thickness. You will find carefully detailed motifs and decorations all around the movement. This kind of workmanship gives you the answer to what happens when talent, patience, and energy come together to finish a watch. The Cotes De Genève finished bridges and overall exceptionally detailed movement is truly the evidence of RD’s dedication. In terms of modern sportive chronographs these touches are second to none and create a perfect blend between sportive and traditional aesthetics. 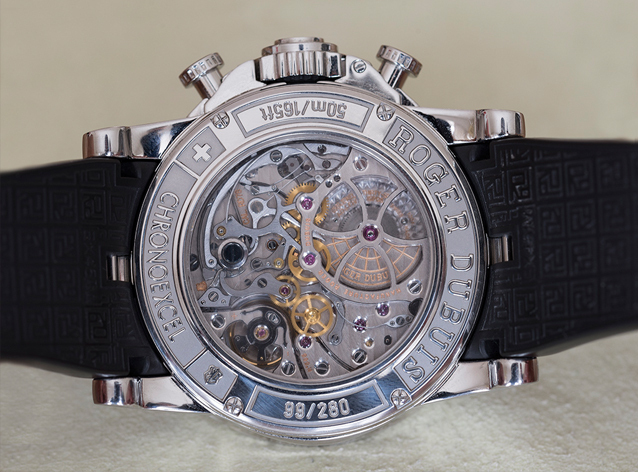 One will certainly feel privileged when looking at the movement through the see through case back. We certainly consider ourselves lucky for being able to examine this beauty. The RD Chronoexcel is really an excellent alternative for those who like unique and somewhat different, funky designs. Considering the momentum of large timepieces the RD Chronoexcel is among the best choices out, regarding its strong visual appeal and amazing movement. The patented production quality, the prestige of the brand, its rareness compared to other brand’s generic models this will be the perfect choice for a number of connoisseurs. The watch’s price might shock you at first, but all these things mentioned above do not come inexpensive of course. We advise you to make good research in this given price range and category before buying the watch. The Chronoexcel’s list price is approximately 40.000CHF (a less affordable alternative among steel timekeepers). We are sure however that these pieces will achieve great success among their owners.